I have written many books on trading. If you are new to trading and are unsure of where to start, I highly recommend my e-learning course which is FREE and you can find it here. Transform your trading into a successful business. In John Piper's follow up to The Way To Trade, his new book The Way To Trade Better returns to the fundamental topic of transforming yourself into a winning trader. Whether you are brand new to trading or have experience and want to move to the next level. Building on more than 30 years of frontline trading experience, and over two decades of teaching and coaching, he explains how winning at trading involves turning your trading into a business. John Piper guides you step by step through his successful five-step process to improve your trading. He delves into essential areas that every winning trader needs to master, including Trading Systems, Money Management, Psychology, Good and Bad habits, and Trading Professionally. Discover your successful trading personality. One of the best books ever on trading and a worldwide classic best-seller by John Piper, now translated into Russian and Chinese. "This book is essential for investors prepared to look below the surface and profit consistently from market price action." "Brokers love a trader who is successful over the longer term. John Piper is such a trader and this book explains how and why." "This one of the most complete and intelligent books I have encountered in trading literature. I highly recommend The Way To Trade to anyone who wants to succeed in trading." At last! The breakthrough all stockmarket novices have been waiting for. Guess right or wrong - it doesn't matter! This one little glitch can FORCE the market to pay you a basic wage of £12,000 to £15,000 a year - whatever happens! Comes with full consultancy for THREE MONTHS. Full MONEY-BACK GUARANTEE if you decide this book is not for you. Whatever you make, you keep - it's all tax free. John Piper says, "If you're not entirely happy with the Tunnel Trader strategy, just send the guide back to me and I'll send you a full refund immediately. No questions, no quibbles. Because I want you to be 100% happy that you made the right decision! You have absolutely nothing to lose." Click below for full details of Tunnel Trader including 3 months consultancy from John Piper. How to trade and profit right now. In late 2012, the charts of USD/GBP, Gold, the FTSE, the DAX and the DOW were all exhibiting triangle patterns. Breakouts from these patterns were imminent, which presented an unprecedented trading opportunity for the technical analyst - if you know how to spot triangles and trade them. In 'Trading Triangles' John Piper explains how and why triangles form, shows you how to spot a triangle on a price chart, and most importantly how to trade these patterns for profit. There are potentially massive moves on the way in these markets. 'Trading Triangles' is your vital guide to keeping on top of these moves and putting yourself in place to profit. Click below to buy Trading Triangles eBook direct from the publisher at only £5.00. Also available from the iBookstore and Amazon. The latest knowledge from John Piper. Over the last few years, the world of betting has changed dramatically thanks to the convergence of betting on sporting events and the trading of financial markets. A new type of betting has emerged which has become the fastest growing area of betting today - binary bets. 'Binary Trading' is for you if you already know the basics, and shows you in detail how and why you need never use a stop again. How you can get the market totally wrong and still make money, and how you can look forward to news items and trade them with impunity. Whatever your current trading strategy, see how binaries could fit into your trading plan and make you money. This detailed and comprehensive book from an experienced trader will tell you just that whilst giving an inside look at the exciting world of binary bets. Click below to buy Binary Trading - web price £26.59, (RRP £34.99). Binary bets combine the attractions of sports betting with the flexibility of the financial markets. Bet on hundreds of different sporting and financial markets. Close out bets before the event takes place. Profit from spectacular price moves. Discover the bet that pays out even when you get it totally wrong! "A great piece of work." "An impressive, thoughtful and readily comprehensible explanation of binary betting." "Very comprehensive and well written." This is the first book on binary betting and it explains in simple language what binary bets are, how to trade them profitably and how to reduce risk. Find out what makes binary betting the fastest growing area of betting and why traders are switching to the new exciting world of binary bets. 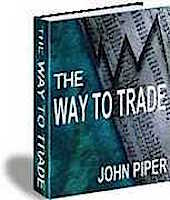 John Piper's startling follow-up to his best-seller, The Way To Trade. This book is not for the faint hearted. John Piper outlines a key strategy to help traders succeed, and you must stay cool, calm and collected so that you can properly operate your strategy. The key to the strategy is taking short term trading positions with a view to doubling your stake. "I have known many traders during my work and I can tell you that the most successful are the ones that build on what they are told. They take a book like this. They read and understand what it has to say. Then they go off and apply those principles to other markets, in different ways, using different time frames. They make the strategies their own – that is the essence of success. It is no good being a sheep, which is pretty much the same as being a-sleep, and just doing what everyone else does – to succeed you have to go that extra mile." Prosper while all around you suffer. In May 2006 stock markets worldwide fell heavily, some by over 10%! This heralded the start of a much bigger decline that affected global stock prices and property. It heralded a recession, which could still lead to a depression, that will affect you and your loved ones. You owe it to yourself to buy this book which will tell you what to look for and what to do. The book comes with a FREE news sheet giving you up-to-the-minute advice and tips on what to buy and sell. Written by pro trader John Piper, author of the best-selling THE WAY TO TRADE.